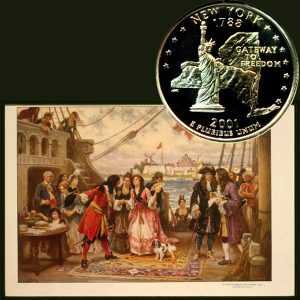 Today, the New York State Quarter Coin remembers when Captain William Kidd sailed from New York on September 6, 1696 with his orders of privateering. In 1695 Captain Kidd was in London, commanding the brigantine Antigoa, of New York, when the king appointed Richard Coote, Earl of Bellomont, Governor of New England and New York. Bellomont was ambitious, and saw in the suppression of piracy, at which the colonial governors had been winking, a field for personal advancement and gain. Before leaving England he asked that an English frigate be sent to suppress the pirates and, not getting it, he decided to fit out a privately owned ship. He cast about for a captain, and Robert Livingston, founder of the New York family of that name, who was then in London, recommended Captain Kidd as the proper man. Kidd was disinclined to take the position, but Bellomont intimated that Kidd’s own vessel would be detained in the Thames if he did not, and he yielded. Bellomont had formed a syndicate to finance the venture, which included several of the king’s ministers. They were to have a large share in the booty, and a tenth was to go to the king. Kidd was given two commissions, one to cruise against the French, the other (under the great seal of England) to cruise against pirates. A vessel was purchased for him, the Adventure Galley, of 287 tons and 34 guns. In her Kidd sailed from Plymouth in April, 1696, proceeding to New York, where he recruited his crew from 70 to 154 men, and from which he sailed September 6, 1696, for a cruise to East Indian waters. Kidd’s crew were as wild a lot as ever steered clear of hangman’s hemp — navy deserters, pirates out of a job, dissolute sailors, fugitives, brawlers and thieves, all attracted by promise of booty, which was offered, according to custom, in lieu of pay. For two years little was heard from the Adventure Galley, either in New York or London, but that little was bad. Ships brought stories that Kidd had turned pirate. One report was that he had taken a great ship, the Quedah Merchant, and had left his own ship to cruise as a pirate in her. This was hard news for Captain Kidd’s wife, faithful and anxious in their New York home, waiting with their two children for his return. It disturbed Kidd’s noble partners also, though for a different reason. Kidd was compromising them. He was not careful enough. He must be dropped. So they sent warships to hunt him as a pirate. Meanwhile Kidd had not heard of the ugly stories about him, and had started for America. His chief partner, Bellomont was there, and Kidd was under orders to report to Bellomont at the end of his cruise. While his backers were anxiously waiting to hear of his capture, Kidd appeared unexpectedly in the West Indies, where he touched at Anguilla, April 1, 1699, and heard that he was wanted as a pirate. Though in distress he was denied stores at Anguilla and at St. Thomas. At length he met, at Mona, Henry Bolton, a merchant of Antigua, through whom he obtained provisions at Curacoa. By this time an English frigate, the Queensboro, was chasing him. Kidd had only a remnant of his crew left on the Quedah Merchant. About one hundred men had deserted him at Madagascar, taking their shares of the plunder, which was worth in all about $300,000. The part left him was worth less than $100,000. Kidd now decided to find Bellomont and set himself straight if he could. He bought from Bolton the sloop San Antonio, which was commanded by a Yankee named Samuel Wood, of Philadelphia. Aboard her he put all his treasure and part of his goods. On the Quedah Merchant, which he turned over to Bolton and twenty-two men for safe keeping at His- paniola (San Domingo), he left about 150 bales of goods, 70 or 80 tons of sugar, 10 tons of junk iron, 14 or 15 anchors, 40 tons of saltpeter, 20 guns in the hold and 30 guns mounted. Captain Kidd was prepared to swear to Bellomont that he was innocent of piracy; that he had taken only ships which sailed under French papers, and that whatever acts of a piratical nature were charged against him were done by his crew, who had mutinied, and locked him in his cabin until the piracies were accomplished. Kidd approached the land first in Delaware Bay, near Lewes, and sent ashore for supplies. He did not go ashore here, nor did he land any goods. A chest owned by James Gillam, a pirate, who was a passenger on Kidd’s vessel from Madagascar, was landed here by its owner and placed in safe hands. Several people who sold Kidd supplies were on his vessel. They were later arrested and swore Kidd landed no goods. Kidd was anxious to communicate with his wife and friends in New York, and to that end he steered for Long Island Sound, entering it at the East end and proceeding as far as Oyster Bay. Here he went ashore and sent a messenger to New York with a letter to James Emott, a lawyer, and a message to his wife. Emott, whose practice embraced the defense of pirates, hurried to Oyster Bay and went on board Kidd’s sloop, which sailed at once for Rhode Island. Here Emott was landed in Narragansett Bay, probably near Point Judith, to proceed to Boston, Lord Bellomont being there. When Emott returned to Kidd, Governor Bellomont sent with him Duncan Campbell, postmaster of Boston, a Scot, like Kidd, whom he knew. Campbell, as an official factotum, was instructed to promise Kidd free pardon if he would come to Boston. Kidd waited for Emott’s return at the entrance of Narragansett Bay, probably anchoring at Dutch Island Harbor, He “ran up the bay to Conanicut Island,” as far as the house of Captain Thomas Paine, where he went ashore, telling Paine “he had sent a man to the governor’s, and was now come to look after him.” Paine was later accused of receiving treasure from Kidd, but denied it. Emott and Campbell joined Kidd in due time. When Kidd heard their story he decided to land some of his treasure before trusting himself to Bellomont. The visit to Gardiners Island followed. To all three sloops Kidd transferred goods. These were consigned to Clarke, who landed some if not all of them at Stamford, Conn., in care of one “Maj. Sellick, who hath a warehouse close to the sound.” Clarke was subsequently arrested for receiving these goods and gave a bond of £12,000 to secure their delivery to the Government. The bond doubtless was greatly in excess of the value of the goods. After landing the treasure at Gardiners Island Kidd remained several days near the Rhode Island shore, where Campbell again came aboard with another message from Bellomont. About June 25th Kidd headed for Boston, after taking on a pilot from Rhode Island — one Benjamin Bevins. This pilot naturally had charge of the sloop, and no treasure could have been landed without his knowledge. He was later a witness for the Government. The San Antonio put in at Tarpaulin Cove, a convenient harbor on Vineyard Sound, and there Kidd landed “a bale and two barrels of goods,” which were “left with the man there,” to be called for on his return. The bale and barrels were duly recovered like all the rest of Kidd’s property. No other stop was made by Kidd’s sloop until Boston was reached, July 1, 1699. Kidd was allowed his liberty a week. During that time he had various conferences with Governor Bellomont and his council. Keepers were put on the sloop, and all the goods on board were seized. Commissioners sent to Gardiners Island received from John Gardiner everything that was landed there from Kidd’s sloop. A morning spent at Gardiners Island makes these facts seem more real, and the myth of Captain Kidd’s buried treasure greater, than they were before one has visited the only spot where Kidd is known to have landed treasure. Sailing away from the island, Sea Wolf took the actual course of Captain Kidd; to Block Island, to Conanicut, and past Newport to Tarpaulin Cove. These are the only spots associated in any degree of certainty with the name of Kidd and his treasure. Kidd was a Scot, thrifty and careful. He never landed treasure or goods without leaving them in good hands. He never went North of Boston, and while his last cruising ground was the East end of Long Island Sound, as we have shown, it is reasonably certain that he did not land on Fishers Island. The Governor of Connecticut reported that Kidd had not been in his jurisdiction, and the island is in Connecticut. There was a house on Fishers Island at the time, and if Kidd had wanted to land goods or treasure there the presumption is that he would have sought the proprietor of the island, as he did Mr. Gardiner, and left the stuff with him. Sailing over the last course of Captain Kidd one sees the folly of hunting for his treasure. In the British state archives is an appraisement of the goods and treasure taken from Kidd. The total tallies fairly closely with his probable share of the total booty of his voyage, less the goods on the Quedah Merchant, which were sold by Bolton at St. Thomas. The exact nature of the treasure Kidd turned over to Mr. Gardiner is known from an inventory made by five commissioners sent by Massachusetts to collect Kidd’s property. The original of this inventory still exists. Besides this treasure the commissioners seized on the San Antonio and at Mrs. Kidd’s lodgings about as much more, and also a small quantity which was sent with some bales of merchandise to the house of Duncan Campbell. From this official inventory one is able to find the exact total of the treasure Kidd brought to this coast. The goods sent to New York were recovered. The total value of Kidd’s goods and treasure was set at £14,000, an equivalent of about $70,000. Kidd’s wife had certain money and plate, and succeeded in keeping them, although her property at first was seized. Had Kidd buried a dollar’s worth of treasure he doubtless would have told her about it. But he went to the scaffold, May 8, 1701, without a word about buried treasure, and none of his crew, of the many who escaped the rope, ever tried to find any of his wealth, after the Government commissioners had finished their work. What was left of his booty, after the legal fees of his case were paid, was made over by act of parliament to Greenwich Hospital. The sum was £6,472, or about $32,000. The New York State Quarter Coin shows with an artist’s portrayal of Captain Kidd at the New York Harbor, circa 1932.